Check the child and ALL family members for lice using a nit comb. To check fine sections of hair with the comb, apply a 50/50 solution of conditioner/water to the hair to help facilitate combing. Work under bright light and watch for movement. Examine the comb after each stroke, wiping it on disposable towels or running it under water. Nits and scurrying lice are so small that they can be easily missed. It’s likely other family members and friends have already been exposed to lice by the time an infestation is identified. 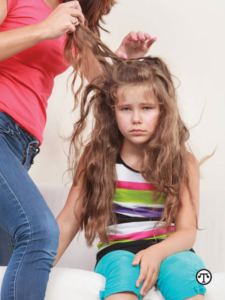 If you don’t find lice but are still concerned, switch the whole family to a daily lice defense shampoo. How is a daily lice shampoo different from a lice treatment shampoo? For starters, shampoo is a form and treatments come in many forms. This topic really deserves its own article, but there is one key difference worth noting. A daily lice defense shampoo is pesticide-free and can be used like regular shampoo to defend your family against a head lice infestation or control against re-exposure to someone who has not been successfully treated. A lice treatment shampoo is used to treat an active lice infestation, and most OTC products contain pesticides so they aren’t ideal for a daily regimen. One gentle daily shampoo that offers ongoing control is Vamousse Lice Defense. It’s been found in laboratory studies to kill lice with each use and is recommended for 10 to 14 days following the risk to help reduce the potential growth of an infestation contracted but not yet identified. Treat anyone who is infested. With lice increasingly resistant to traditional over-the-counter pesticides, look for a pesticide-free treatment that is proven effective against super lice. There are many new types of products, so read the instructions carefully. For example, Vamousse Lice Treatment comes in a convenient mousse format that kills lice and eggs before they hatch—in just one application. Lice eggs are rendered no longer viable with this treatment, so there’s no waiting for them to hatch to treat again a week later, thus decreasing hassle and the risk of spreading lice throughout your family. If you are concerned about your home, vacuum, and then wash and dry any launderable items in high heat. For items that cannot be washed or soaked in 130° F soapy water, the company offers a powder that is the only one on the market proven to eliminate super lice in the environment. For more facts and tips, go to http://vamousselice.com.